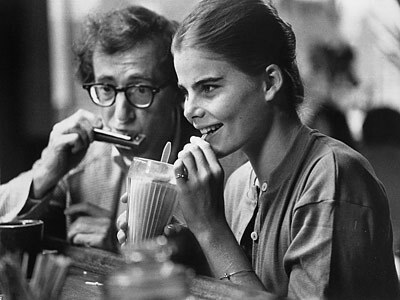 This past weekend I watched Woody Allen’s Manhattan for the first time. My first inclination, as it always is with anything related to Woody Allen, was to become annoyed and exasperated. Here were neurotic (of course) over-intelligent characters; a woman who was smart but couldn’t articulate her own emotions; and a young girl with the poise and confidence of a thirty-three year old woman. These sort of characters represented the kind of artificiality I have always attributed to the Woody Allen “New York” films—aristocratic, artistic, intelligent people that go to overexaggerated lengths to display those elements of our human necessity. Overexaggeration is very much required in fiction—art is not necessarily life. However, I do look for the subtle touch and while some may think that Allen has it, I don’t. All this being said, I can appreciate the fact that the movie is a “love letter” of sorts to New York City. How Woody wanted to shoot it in black and white so that it resembled some untouchable image of glamour from the silver-screen of his poor Coney Island youth. And he does accomplish this feat: the Queensboro Bridge sunrise scene; the cab ride at night; the horse carriage scene (straight Great Gatsby); the Central Park in the rain with newspapers over the head moment; the sitting in the courtyard reading the Sunday papers shots. Manhattan, more than anything else, is a movie that presents an image of the New York we want to believe in. Manhattan shows the term “New York” in moving images—that the images or narrative may or may not resemble truth is another matter (I still believe more firmly in the summer dusk shots in Rosemary’s Baby as my actual lasting memory of New York). What actually matters is that this film, this piece of art, makes New York into a manageable object. For the moments of the movie the city can be held in our hand and even though it is precious and brittle, it strikes some chord in us—a prolonged feeling that has to mean something. On Saturday, I woke up more hung-over than I wanted to be. I’d poured two bottles of coconut water down my throat (even though I hate coconut water) at 4:00 AM in order to combat any kind of hangover, yet I still woke up feeling hazy and dehydrated. So, I drank water and watched college basketball. Then, I attempted to play basketball with my friends. My ball was deflated so naturally the idea fell flat. I watched another hour of basketball and then decided to go buy a pump, which is what one does when they want to inflate a basketball. So, I stepped out into the sun and walked along Manhattan Avenue to go to the sports store in Greenpoint to buy a pump. 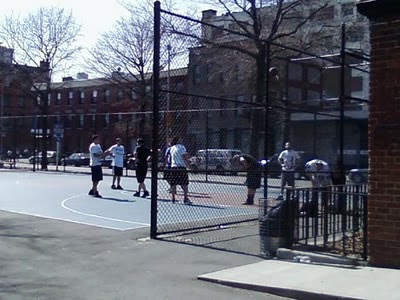 Along the way, I sized up the basketball courts near McCarren Park to see if there was a full-court game that I could inject myself into. The courts were fairly packed so I made a note that I would walk all the way to Franklin Street near the water in Greenpoint to play at the park there. I stopped along Manhattan and bought a cheap Spaulding pump and continued on my way. The mid-afternoon breeze kicked up in the shade but it smelled of Easter. Flowers had been on my nose because the weather had been warm and my work is full of women who love interior design and my boss has an office full of fresh flowers at all times. I passed Peter Pan Bakery and smelled confectioner sugar in the air so my weak stomach growled. I continued on Manhattan and then turned down Greenpoint Avenue where the sun shone stronger in the street, so I edged off along the car-line and stood where the light broke onto the concrete. The sun made my skin feel tight and I watched as two guys about my age giggled while they passed an Asian man who was holding the door open for another Asian man at a poultry slaughterhouse. I turned onto Franklin and saw people sitting at tables outside of the Pencil Factory, a bar on the corner. I looked at the table where I had sat on a date on a warm bright evening with a very pretty actress late in the summer of 2009. I remembered that I’d wanted to care more about her, but couldn’t and felt sad. So, I continued on past new boutique shops until I finally reached the park. I passed couples kissing on benches and sat down to pump my basketball. Parents were watching their children slide down the yellow slide and I decided to pull up my socks and tuck the legs of my pants into my sneakers. I surveyed the court and felt the coolness of the fading sun. There were a few high school kids playing and one solitary Polish man awkwardly shooting foul shots. I decided I’d walk down Franklin along the water where it was warm. I knew there were courts on Grand and Wythe that might be open. The sun was starting to get low in the sky over the East River as I passed the park. There were lesbians walking in front of me and I wished the ice cream carts of the summer were there, though I didn’t miss any of the waterfront music. I grabbed the bars in front of the park and almost wished they wouldn’t have any concerts again because they were missing the point, but then I remembered that if I thought that then I would be missing the point, so I continued to walk. The fully built high rises made the street quiet, contained and shielded from the waterwind. There were new wineshops and pharmacies and everything looked quiet, nice and paid for, which made me feel at ease. It occurred to me then that living in a place for three years is a longer time than you imagine and that if you don’t walk on certain streets often enough you can forget that they exist or that you had moments with friends on them. I reached the courts at Grand and Wythe and they were filled with kids playing with their fathers or uncles or whomever. I knew that I just wanted to shoot by myself so I decided to go to the courts right next to the BQE near Meeker and Metropolitan. I knew I’d be able to practice my post moves and my back-down dribble in peace there. 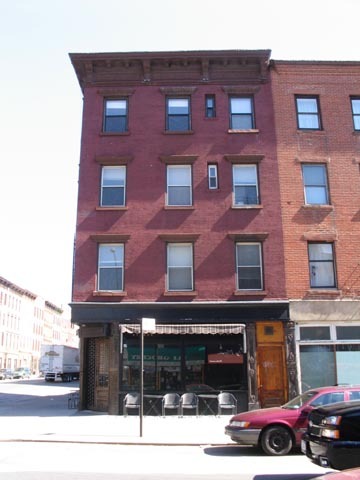 As I walked up Grand Street I noticed a rustic home furnishings store next to an Italian restaurant. I looked at the restored sinks in the window and decided that whenever I owned a home that I would have interesting slabs of wood in my kitchen to cut meat and vegetables on and that I would have a deep kitchen sink to wash dishes and pans in. I walked aimlessly along Grand before cutting down to Metropolitan where I saw two guys about four years older than me throw a leg of meat at the fourth story of a deluxe condominium building while the sun was still out. I felt sad, but hungry because there were so many good new restaurants on the street. When I reached the courts at Meeker and Metropolitan, I noticed thankfully that there was an open court for me to play on. I took off my sweatshirt and warmed up by practicing the spin on my shot with one hand. Then I shot bank shots from either side of the paint until I felt loose. I dribbled behind the back a little bit and shot some fancy layups. Then, I practiced my steps on a back-down dribble on the right side of the court before I spun and shot a jumper in the paint. I practiced this move a few times on the right and then on the left. At times imagining I was Magic Johnson or, even more realistically, I was Ray Felton. I was working on spin moves when a Latino father asked if I wanted to play with his group. I said yes, even though I didn’t want to because they were all thick looking Latino guys who seemed to play too loose and without passion. I was right as they messed around. I didn’t even want to break a sweat. I broke free and got layups and didn’t have to play much defense like you do in a bad pickup game. After awhile, I got into a few arguments with the guy who asked me to play because he said my first step was illegal, when it was actually not. When you receive the ball, you do not have to dribble if you make a step and move to the basket in one motion. Since we argued a few times, we threw punches. Luckily I didn’t get beat up because there was a child there who had to go to the bathroom. So, I left and started walking with my newly pumped ball in my bag and my stylish black jacket pulled around my beat up grey sweatshirt. As I was walking up Metropolitan and the cold of the night was edging in, I passed a bar. Light still glared over the roofs of buildings. As I passed the bar, I heard “Last Nite” by the Strokes playing. Women were sitting at the bar and my vision was obscured by the shade. They looked pretty and the bar looked neat and it was still light out. Cars passed on my left and I knew that all the restaurants would be serving dinner and that these people in the bar would soon want to eat somewhere. “Last Nite” was playing and I realized everything that I had believed about the Strokes was true. The next day, Angles, the long-awaited fourth album by the Strokes leaked and I listened to it all day. What you will hear about this new Strokes album is that it is uneven. That much of the sound is very derivative of the 80’s. You will read reviews that say this album is an album of a band in transition. That they have laid a new sonic blueprint that their songwriting has to grow into. You will read reviews that say the album feels too assembled. Each of these reviews will be true, but the fact of the matter is that this is the best album the Strokes have made. You can go back and listen to Is This It? and there is a batch of great simple songs, but those songs don’t want to be anything. The world made “Last Nite” what it is. When you listen to that album again, there is no punch or muscle. I’m not saying that they lack polish or that its necessary. What I am saying is that you should just listen to it again on loud speakers and realize how that album was a missile that was shot tentatively. People like you and I made the impact mean what it did. In a world full of bands that rise to the surface and subside thanks to a favorable run through the Pitchfork, Stereogum, Brooklyn Vegan, Pitchfork.tv, Rolling Stone gauntlet, there is no band that we still talk about in the same terms that we talk about the Strokes. Vampire Weekend and Arcade Fire may sell out arenas, but in so many ways they will never be the Strokes. And perhaps those bands are more accomplished than the Strokes will ever be, but they will never be the Strokes. We’ll never know them or care about them as individuals (Vampire Weekend has a shot. Their Columbia pedigree is a handicap unfortunately). 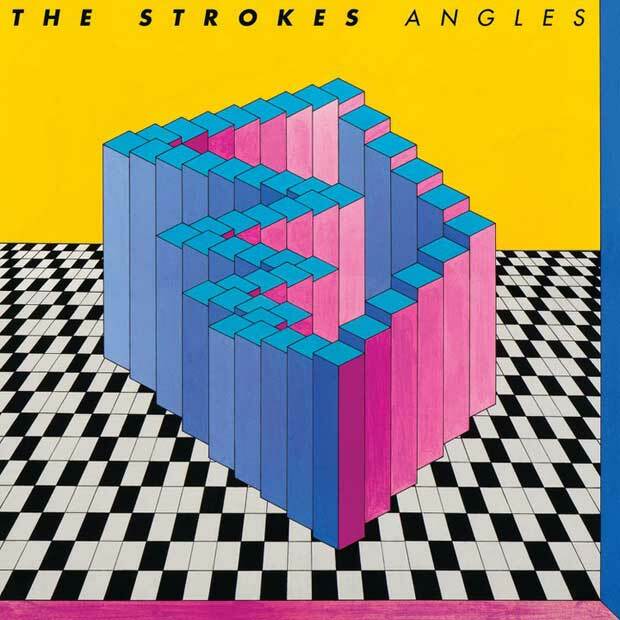 Angles is the best Strokes album perhaps because of time. One of the best qualities of a Strokes album was that the fifth song turned into the last song in almost an instant. At one moment you are firmly ensconced in the middle of the album, some track with warm guitars strumming all around you, then you are lifted up by the late-placed single on the album, and all of a sudden the whole damn thing is over. Angles gives you that same Strokes feeling. I was a full supporter of First Impressions of Earth but it lacked that phenomenon. So, after such a long time between albums that had that essential Strokes quality, Angles makes you remember it, perhaps in a way that isn’t completely truthful. But, like I said earlier when talking about Manhattan, maybe truth isn’t exactly the point. For Manhattan is not the city that many of us know. Manhattan is the city that we like to imagine. It is New York if we could hold it in our hands. And so the Strokes have always been the New York we want to hold in our hands. The Strokes are a faulted and perhaps failed rock band. They are annoying and they make missteps just like Woody Allen has done throughout his entire career, but they still manage to make you feel something that you feel nowhere else. So many people look to New York as something. Either they look to it as the end-all-be-all of human existence or they look to it as a way of life they would never want to be a part of. No matter what perspective you take on the matter, you are still a human and you want to hold New York, as the object that it is, in your hand so that you can regard it and understand your relation to it. When you watch a Woody Allen film and when you listen to a Strokes album you get that opportunity. When I walked past that bar after fighting with a stranger when I didn’t want to, “Last Nite” was playing. It wasn’t triumphant, it was just a reminder that the Strokes will always be there and the Strokes will always be what it is to be young and to be in New York. No one else writes songs like “Under Cover of Darkness” or “Gratisfaction” off Angles. Radiohead may “change the music industry” with each release, but they don’t change your stride with each step you take in the subway on a Tuesday morning in March. When I passed that bar and the sun angled along the rooftops in the oncoming evening, I was not celebrating another day spent in New York, I was lamenting the passing of time and the hope to grow up. When I heard “Last Nite” coming from the open doors of a shaded, cool, bar it was just another reminder that life is better when the Strokes are around and, that no matter what missteps they make, they will never go away. Because, even if they don’t reach the heights that other bands who come along do, they captured our imagination and they will always be able to do that, though it may be for small moments at a time going forward. However, having your imagination captured for a moment will always trump anything else in life. And if you don’t believe me, then just watch Manhattan, or maybe Annie Hall, those were the only singles that ever mattered anyway. If the bar sinks surface is left wet or coated with food and other contaminates the metals in the stainless sink cannot form this protective layer and become susceptible to stains and rust marks. Thanks, Hann. Love the input.